Jonesy: So, this movie is coming out during Christmas? GHOST PROTOCOL is so filled to the brim with action, explosions, and snarky ridiculousness that it was snap you out of the holiday mood and make you feel like you're watching a summer popcorn flick. This movie is so much damn fun. I haven't seen a Mission: Impossible movie since the original, and from what I've heard about two and three, GHOST PROTOCOL is the best of the series. Now the plot is exactly what you expect going in: mission goes wrong, people die, there's a cover up, and the team must go in, without outside help, and correct the mishap and stop the bad guy. I'm not normally a fan of a cliche plot, but when a movie can pull it off, I can endorse it. The strength of the movie lies with the characters and the action. And when I say characters, I mean Simon Pegg and Jeremy Renner. Pegg is the "new guy" on the team, and almost acts as a gateway for the audience. When things get confusing or crazy, he's there to ease the tension. Renner is also new to the team as the guy with a mysterious past (because why not right?). Renner usually plays characters that are confident and assured, and here his character shows many insecurities, which makes one scene especially tension filled. Cruise feels almost like an after thought in the movie, even though he's the leader. His character isn't the most interesting part of the movie, but he is the "serious" aspect the team needs. The action pieces are really what makes this movie such fun to watch. I was able to view the movie in IMAX, which made me feel completely engulfed in the action. The most astonishing sequence was Cruise scaling the Burj Khalifa tower in Dubai. The sweeping shots of the hotel are breathtaking, and if you weren't afraid of heights, you might be after that. I found myself holding my breaths many times almost to the point of closing my eyes. (Of course it doesn't help much that I have a tad fear of heights). And what's even more insane is that's a sequence that's only in the middle of the movie. Overall, GHOST PROTOCOL was much more enjoyable than I was expecting. Even though it feels like a summer movie, I'm glad that it came out during this season to cleanse the pallet of whatever epic/war/indie dramas that come out during the time. Javi: My history with the MISSION: IMPOSSIBLE franchise is one of just vague memories and flashing images. I remember that as a kid my Abuelito used to let me watch the original 1960's TV series, which was dubbed in Spanish. The only thing I remember of that show was the exploding recording devices that explained the mission, and this one episode where a dude was strapped to the bottom of a spaceship so it would burn the guy alive as it was taking off. Then with the original movie, I just remember some dude getting spikes to the face and lots of mask wearing. For the second movie, I remembered Limp Bizkit and more masks. The third movie had Truman Capote and again, more masks. So needless to say, I'm not well-versed in the mythos. I have always been amazed at the ability of the franchise to feel completely new and almost like a reboot with each new movie. Now with Pixar director Brad Bird's live-action debut, we have one of the better entries of the franchise. I had a freaking amazing time with this movie. I usually hate to talk about the whole "turn off your brain and just enjoy it" argument, but it feels somewhat appropriate for this movie. The action and the set pieces are the real stars of this show here. My diminutive partner already went over the plot, and if you've seen one M:I movie, you really wouldn't be surprised by any of the plot. The team dynamic is a very cool one with the fact that there's actual continuity for once with Simon Pegg's character actually being taken from a previous movie. Another highlight was Jeremy Renner, who thanks to rumors, was seen to be the potential replacement for Tom Cruise's Ethan Hunt in the series. Instead, he is just a newcomer to the IMF group and adds a surprising amount of humor to the movie and another more interesting dynamic to the team. Honestly, the weird motivations of the villain, a former nuclear expert, and the actual mechanics of the plot don't make much sense to me, especially the way everything plays out. But then again, do we really watch M:I movies for the great plot that totally makes sense? Not really, we watch it to see what sort of things Ethan Hunt will be climbing out of this time. The movie is not a disappointment by any means, but this is a movie that spends its time setting up dumb reasons for characters to do really cool things. But when the action hits full force, it is awesome. Put it this way, the price of IMAX admission is worth the Dubai sequence alone. That particular sequence is an insane three part sequence that had me freaking out. So try to make it to an IMAX theater to see this. The action is so immersing that you truly feel like you're going to fall or get crushed like the characters. This was a better visual experience than AVATAR, which was the last IMAX movie I saw. 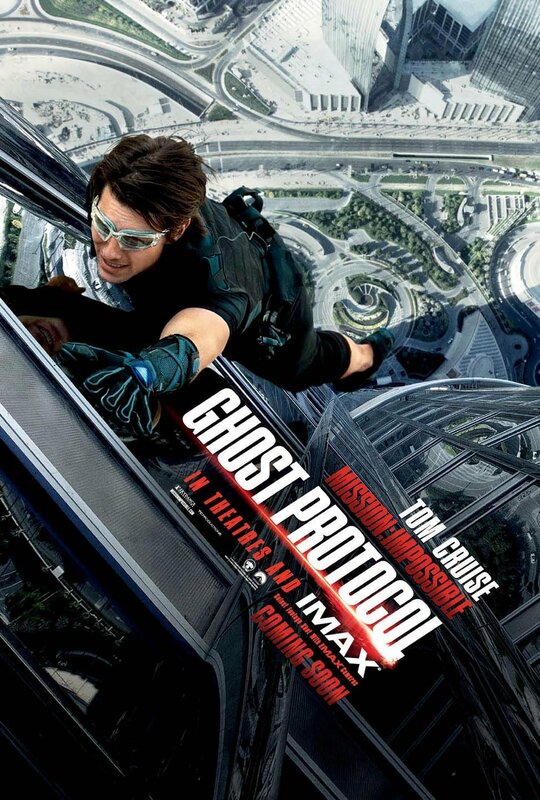 While it's not a perfect movie, MISSION: IMPOSSIBLE- GHOST PROTOCOL has me excited for the IMAX as a more viable specialty format for the theater experience. It also has me anxious to see what Brad Bird can do with an even better script than this one.